Sean Williams is fortunate to draw together many of important themes in his life into his daily work. 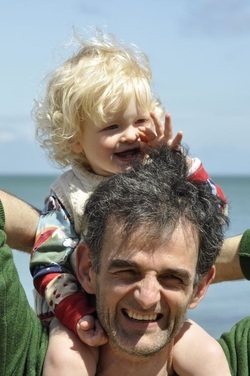 He is a HANDLE® Practitioner and Instructor and a Sherborne Developmental Movement Practitioner. He is currently on the Feldenkrais Professional Training. He began his career as a health care provider in 1986 after studying Shiatsu with Sonia Moriceau, and later went on to study Seiki with Akinobu Kishi. He practises Play therapy inspired by the Special Time and Son-Rise approaches and of course Amerta Movement. He studied Ecology at Edinburgh University. His family, Una Nicholson, Ollie and Vernie have immeasurably enriched his life. He combines all these influences along with Amerta, while helping individuals and groups reach their potential.